There was me. There was a Naga not hitting me. There were gate guns hitting me. There were ECM drones not able to keep up with me. Although a few other things happened during the night, that was my highlight. Others may have different moments. For me it was this Naga.
" maquinista > also plz dont shoot me for the next 5 minutes im kinda busy rolling one on the side and cant press the cyno button"
There was wind of a possible carrier and marauder out doing level 5 missions. While that was worked on the rest of us gathered in a loose group. On my way to find the boys I got to watch someone else get ganked. They almost made it back to the gate before the fleet burned them down. I jumped through to safety but it is amazing how well I knew that "damn" feeling that comes along with it. I am still not in love with the new explosions. I miss the vivid blue eruptions into transcended incandescent energy. Off I went. Being in a frigate, I've been working on my pounce bookmarks. As the mighty fleet tackler I must be prepared! I bounced away to make bookmarks while the boys loosely gate camped a high sec gate. Of course, a hoarder jumps in and they kill it before I can land. Damn. Haulers are so intriguing. Someone once asked why do we kill haulers because they cannot shoot back? Nor can a bowl of skittles, yet I will still eat all the grape and strawberry ones without any guilt. Zero guilt. Just delicious skittles. Haulers are like the orange skittles. Not grape or strawberry but still much loved. There was some guy in local watching our gatecamp. I find that happens alot. People are fascinated by the process of a fleet and the fleet killing people. Because many people assume that all pirates do is gatecamp, our occupation of time in a productive manner while the fleet composes itself is often confused for said camp. 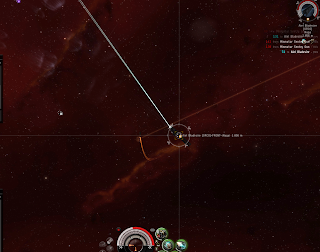 Once we were all together and the possible carrier kill was looking like it would not pan out, we decided to head out into busier red space and find what we could to kill. It was not a few jumps over that the boys killed a Myrm. We had seen it a few systems over and it jumped into it. I was told to hold on the gate to jump through and tackle it. Instead, it just sat there and tired to fight back and died. Unexpected but it put a bit of blood on the tongue. Off we rampaged, sending Razor in first as bait. Razor, it seems, makes terrible bait in his Brutix. However, while we were waiting on a gate a Hurricane warps in at 100 off of us. Sensing a trap, I see that he has a pounce directly between the sun/station and our fleet. LR decides to go and meet the Hurricane in his Sleipnir. I hold back, ready to bolt in either direction to tackle the fleet I am sure will land in a moment. The cane starts slowly (as in 17mps) burning in towards us. That was weird, kinda baity. Then, it seems to realize that a Sleipnir is about to be in its face and starts to burn away. LR catches up and goes, "Its armor tanked!" as he burns through its shields. I decide to go in and whore on said kill mail when it disintegrate (before I can get on the killmail) and we discover that it was an empty hull. Uhh...? "I'm going to undock this naked hurricane and go peek to see what that pirate fleet on the gate is doing! Best idea ever!" His second great idea was not warping his pod away fast enough. Jaguar pod tackle. Then Razor killed another cyno. His second kill for the night. These were pointed out to him when he complained about not getting on any of the kill mails so far. I think our second logi ship joined us around this time and caught up. That was why we had been hanging on the gate visited by the naked Hurricane. The hurricane, I think, had a destroyer friend. He landed and jumped and we jumped and tackled. We thought he was going to make it back to the gate. He then aggressed and Titus had him webbed all to hell. I went for him for point while trying to stay out of possible web range. I love the speed of a frigate. Trying to manage it is more intensive then people realize. It is so easy for me to slide out of range for a point as I try not to get into range of webs at the same time. They grabbed point as I almost lost point and he went down. I spun around back as Diz goes, "Sugar the pod!" and nab it as I sweep back into range and bam. Low-grade snake pod down as Diz cheers and I feel like the best tackle evah! Still glowing two systems over our Harb pilot manages to get a warp in on a Naga. Diz tells me to go and I roll like a beast. The Naga is faster than the Harb and the Loki. They lose webs on him and start to lose point as I land. No time for subtly. I have to trust the Jag's tank to keep me alive long enough to burn into range, lock into a tight orbit and hold the Naga down as the fleet arrive. The station guns started to tear into me as the Naga rolled into gategun range. However, the logi landed and took care of me. At some point I realized that I needed to pay more attention to my cap just as I started to run low. The Naga is trying to shoot me, I'm not being hit, a flock of ECM drones is chasing me and failing to catch me and then it dies just as I run out of cap. I even had the wrong ammo loaded! Woo! Fantastic. That felt like the perfect execution of my job as a tackler. I'm going to miss out on kill mails because my job isn't to shoot all the things but to make sure that things don't get away and avoid being shot. But I am also going to take care of business when I can and grabbing, holding and working through that Naga was satisfying. I'm buzzed happy now. If my Jaguar exploded after that I was fine. It had more than paid for itself. We wound up trying to catch waves of frigates running around. An Incursus is all I was able to grab from that wave. Further on, outside of Amamake we went to sniff around and see what was going on where. As I was sent to peek on Fweddit and Late Night I saw a Jag in mid warp. I commented on it, but it decided to jump into the boys and die as I was two systems away. Grrr. Some intel came through while I was trying to scout systems. I ran back to Amamake as all sorts of local spikes happened and people descended from Errywere. We wound up in a fight with Fweddit and some Amarr people. We nabbed and shot what we could and tried to stay alive. A Caracal decided to shoot at my Jaguar from around 80k off. I decided not to go for him and stayed on the gate where I could better take care of the majority of the fleets needs. After that, tired and it getting late for about half of us, we started to work our way back home. Home was uneventful. I broke off and logged for the evening. The boys ran out and killed more things before calling it a night. I am really enjoying the tackle frig life. Hey Sugar I think the formatting is wrong on this page, all the words are on the right hand side and squished up together.